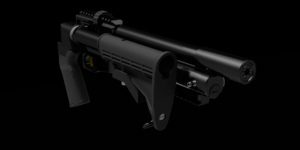 EVOL Tactical is Now Available to Order in 22 and 30 Caliber! Improved sidelever geometry provides a lighter cocking effort. New regulator seat and piston virtually eliminate regulator output pressure slope. New ambidextrous safety location improves ergonomics and feel. 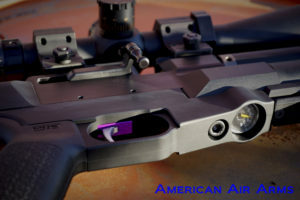 Improved trigger and sear geometry for crisper feel and wider adjustment range. 1/3 lighter lower picatinny rail. More efficient valve provides an increased shot count with reduced regulator set point. Increased magazine capacity. 30, 25 & 22 caliber are no 9,11 & 13 pellets respectively. The heart of the EVOL is its robust regulated sidelever repeater action matched with its high precision hammer forged chrome moly tensioned barrel system, which provide the most consistent velocities required for extreme accuracy. 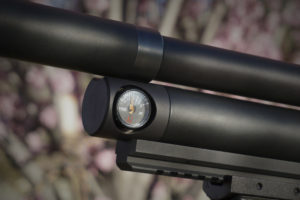 EVOL’s barrel is firmly threaded into the receiver for maximum rigidity, unlike others that use set-screws, EVOL’s barrel can’t be knocked out of alignment during demanding field use. EVOL is 100% made in the USA from the highest quality materials. Receivers, levers and rails are made from 7075 high strength aluminum and titanium reservoirs make the EVOL both robust and lightweight. 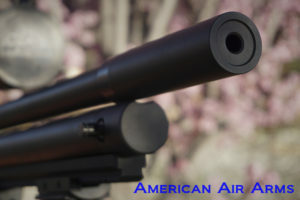 American Air Arms manufactures all of our parts in-house enabling us to maintain full control of supply and quality.